As a tradition around this time of the year for the past couple of seasons I've been doing a special episode on annual business planning. 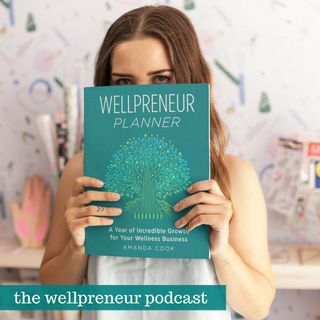 And I'm so excited that we're doing this episode right today, when it's also a launch week for The Wellpreneur Planner! It's the new companion planner that I've made for The Wellpreneur Book, that takes you step by step in planning an incredible year for your wellness business. And one of the reasons I started working on this ... Más informaciones project was because planning episodes so far have always resonated with you and been super helpful, and another that when most of you finish reading my book, you are ready to go a step further and make deeper plans, which is exactly what this planner is meant for. And the idea that this should be a physical format product is so that you could take it with you wherever, not having to be stuck at the screen while doing your most creative work. And because this is something that I practice in my own business, today I'll be sharing with you some advice on how to successfully plan your business year, but moreover starting next week I'll be taking you through one of the steps from the Planner each Tuesday for the next few weeks in our Facebook community, so all of you can follow along and start making your big plan! And this will be a gist of all the great content to help you plan your year. And because I really want all of you who really need this kind of resource to help plan their business to be able to get it, The Planner launch will happen on Black Friday, that's end of this week, and it will be available at HALF PRICE on Amazon this weekend only. So you don't forget about the sale special, make sure to 1) Join Wellpreneur Community on Facebook 2) Check our emails this week, as we'll be sending sale reminder 3) Mark your calendar for Black Friday SALE and search Wellpreneur Planner on Amazon this Friday :) Now let's dig into mapping out an incredible year for your business!